In large bowl, combine all ingredients; mix well. Cover; refrigerate at least 1 hour to marinate. 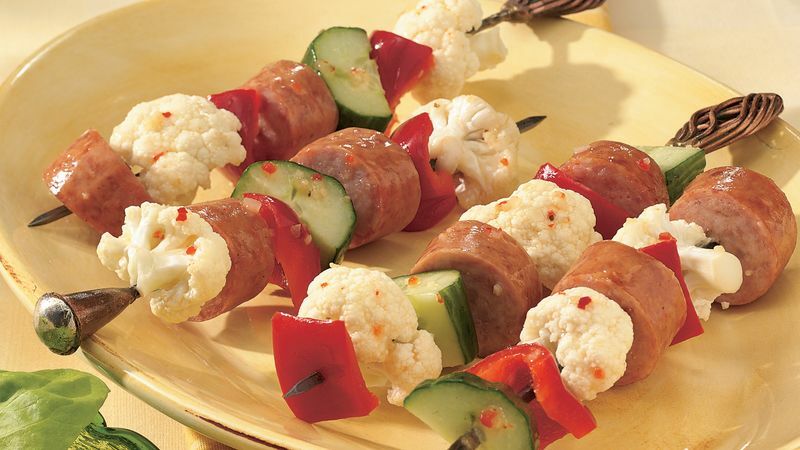 To serve, alternately thread cauliflower, cucumber, bell pepper and sausage onto eight 8-inch skewers. Discard remaining dressing. Planning food for a crowd? The recipe for these tasty kabobs can easily be doubled or tripled. Instead of using just one red bell pepper, try a combination of yellow, green and red bell peppers. For even more texture, flavor and color, thread 1-inch cheese cubes in between the vegetables and sausage pieces. You can also serve these no-cook kabobs on decorative skewers found in specialty cookware stores.